How do I get OS X 10.11.6 to return my free space? but a df -h in the terminal as I clear never changes from 89 GB free, and when I try to restore some things from Time Machine, the 'not enough space' message reflects the df results, which should be wrong, instead of the disk utility display. I only have the one volume on my hard drive. This isn't the same question as the proposed duplicated, at all. I am not suggesting that anything is eating my disk space. I'm also not saying that restarting it changes anything. I'm stating that the disk util says I have 300 GB free, which is likely the case given what I deleted, and the OS says ~90 GB free, an amount that did not change as I was deleting things and did not change when restarting the system...so basically the freed space was not given back. Rebuilt the spotlight, then rebooted and reran disk utility. It showed a problem with the free space index. Rebooted into recovery, ran the disk util, and it repaired the disk. Unfortunately, df -h (the lower free space amount) seems to have been correct all along, and disk utility and selecting info for the drive from finder were incorrect. All are in sync now. Not the answer you're looking for? 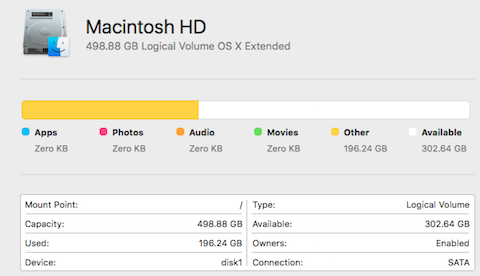 Browse other questions tagged macos el-capitan disk-utility disk-space . How do I re-add “free space” partition back into a single drive?